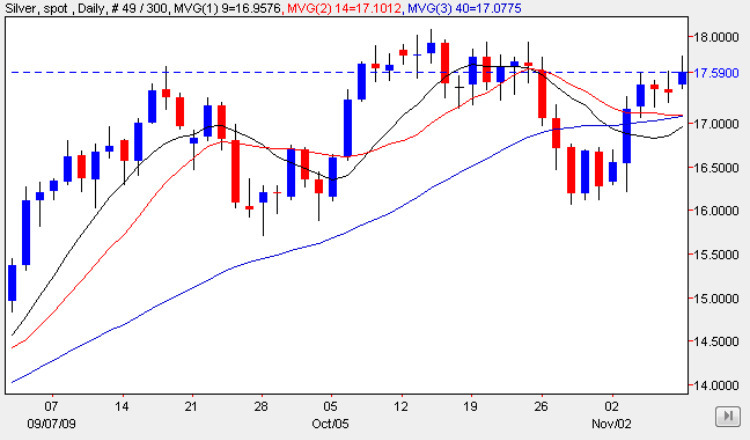 A weak performance for silver spot prices yesterday, with the silver trading session ending with a narrow spread up candle, but one with a shadow to the upper body, indicating a degree of weakness as the market tests the resistance directly ahead once again. This area of potential resistance is now proving to be a stubborn barrier for silver prices, and until we see a clear break and hold above the short term level at $18 per ounce, followed by a move above into clear water at the $18.50 per ounce price handle, then this technical price area seems set to dominate silver prices in the short term. Gold prices, of course, continues to break higher into new high ground, but even this looks set to fall in the short term despite the longer term trend which is channelling higher in a series of higher highs and higher lows in text book fashion! Spot silver on the other hand is still battling to clear the a above price levels, and until we see these breached then no clear picture is evident, with all three moving averages now tightly bunched and adding little to our analysis for spot silver prices in the short term.